Both sets have just been released, so with decals now to hand here are some additional comments. First impressions are powerful – the full colour artwork looks really great, quite inspirational. It made me want to abandon the current model in progress and grab the Wingnut Wings Albatros from the stash and get on with it. This is what after market decals are all about in my view – something colourful, interesting and different, that will make my model stand out. 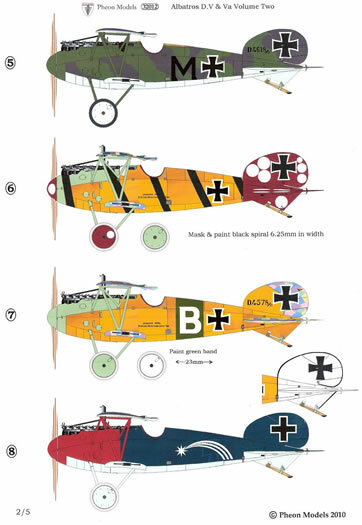 Side and top views of every aircraft are included on the decal placement guides, printed on glossy A4 cards. By omitting national insignia Pheon have been able to get a lot of markings options onto each A5 sheet. There are ten schemes in Volume 1 and nine in Volume 2. Wingnut Wings crosses are well printed and accurate so no purpose was served by including them. 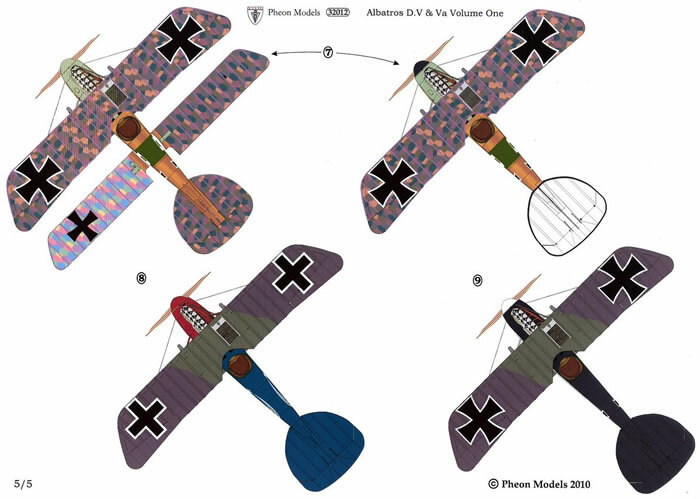 In Volume 1, two of the aircraft have lozenge fabric on the flying surfaces. 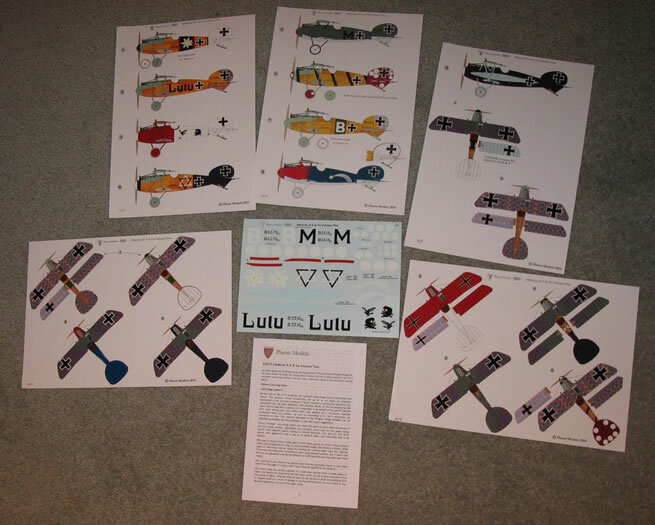 Modellers with the Wingnut Wings Albatros DV or DVa kits in their stash will know that no lozenge decals were provided in the kit as all the aircraft were in the mauve/green finish (which was a slight disappointment for me). 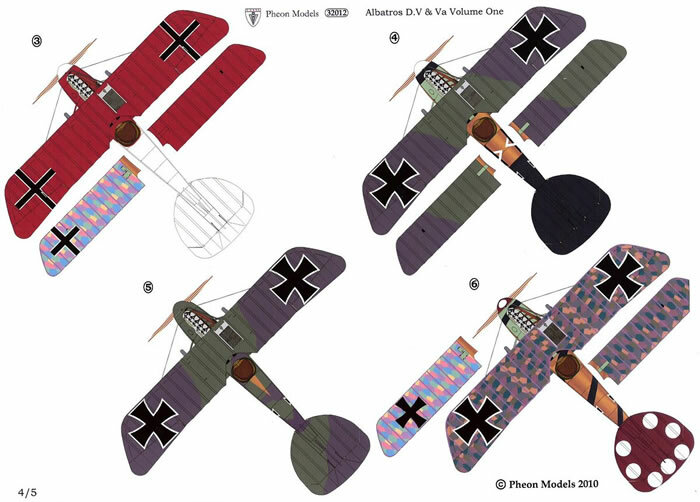 Pheon note in the instruction booklet that 1/32 scale lozenge decals are currently in development, in association with Richard Andrews and Harry Green of theaviattic.com. Pheon are in the final stages of custom matching printing ink mixes to Richard and Harry's desired colours - no off-the-shelf Pantone colours. The production deadline is to have the lozenge decals available at the UK Nationals at Telford in November. 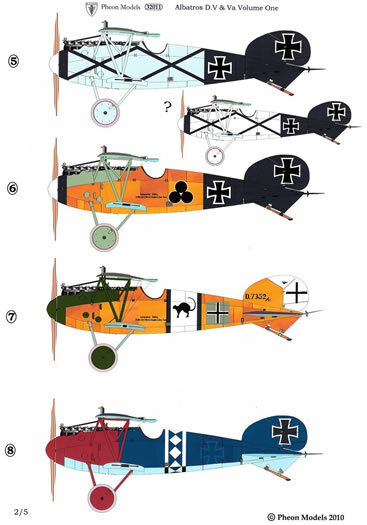 I am sure this will be well received by those modellers wanting to build a 1/32 Albatros with lozenge finish. The lozenge colours in the artwork are approximations only and are not representative of the final lozenge fabric decals. 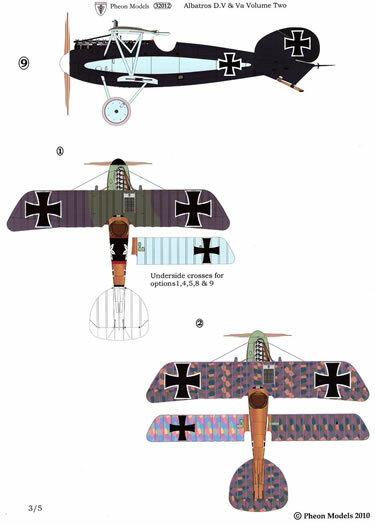 Seven other Albatros in Volume 1 feature the mauve/green scheme on the wings and tailplane. The only ace of any note in Volume 1 is Arthur Rahn who, although he only scored six victories, survived the war and emigrated to the USA, dying in 1962 . 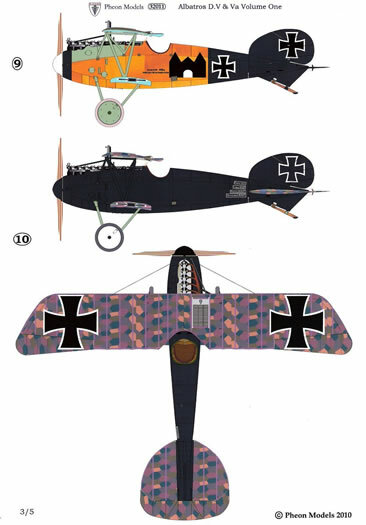 After the Airforce Museum used Rahn’s markings for their replica Fokker Dr.1 the Rahn family donated all of his memorabilia to the Museum, including his photo albums, decorations, orders, and honour goblets (ehrenbecher). His albums have been a rich source of information for WWI aviation researchers. Rahn’s aircraft has the striking Jasta 18 scheme of all over blue with red nose. 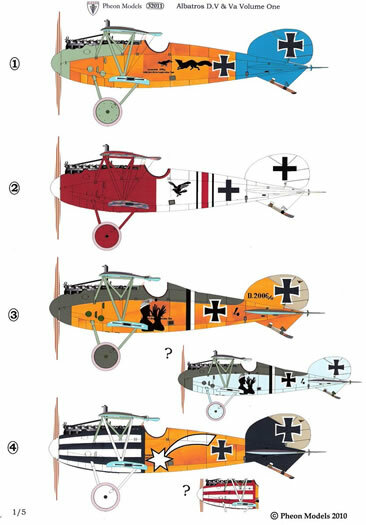 Famous aces in Volume 2 include Paul Baumer (43 victories), Karl Menckhoff (39 victories) and Erwin Bohme (24 victories and Jasta Boelcke Staffelfuhrer). Note that Baumer’s aircraft is the Jasta Boelcke machine not the Jasta 5 one with the green tail. In Volume 2 four of the aircraft are covered in lozenge fabric. 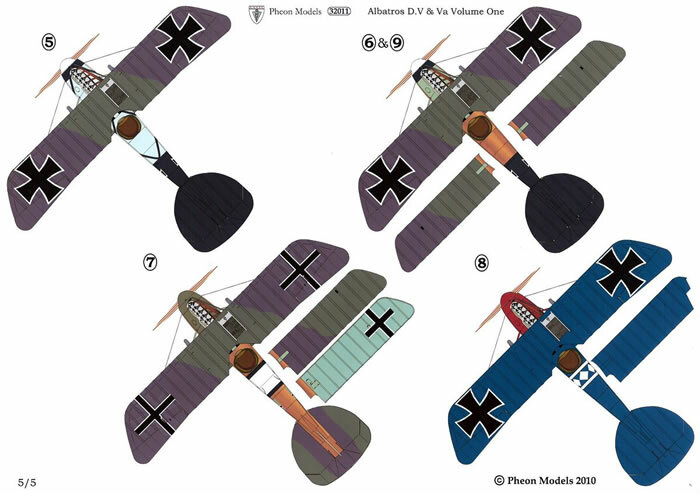 Erwin Bohme’s Albatros with green fuselage band and white B is the same one featured on the cover of Osprey’s SE5a vs Albatros DVa book, painted very evocatively by Jim Laurier. The green band will have to be masked and painted (I presume space constraints prevented it from being included). A number of the schemes are rather quirky and full of character. I particularly liked Otto Fuchs’ fox chasing the (presumably French) cockerel - a nice play on his name which means fox in German. Also in Volume 1 is Kilian’s playful ‘cocking a snook’ figure. 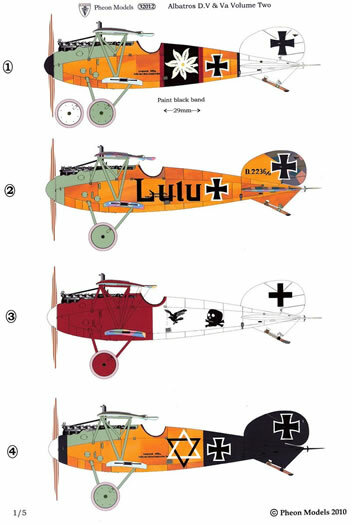 In Volume 2 ‘Lulu’ is presumably a diminution of the pilots name: Ludwig Webber. 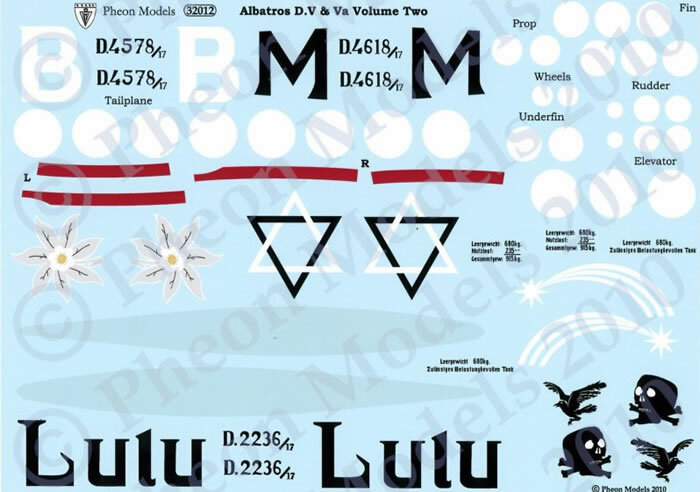 Pheon decals are printed by Fantasy Printshop in the UK and perform well. They are thin and have minimal clear film. 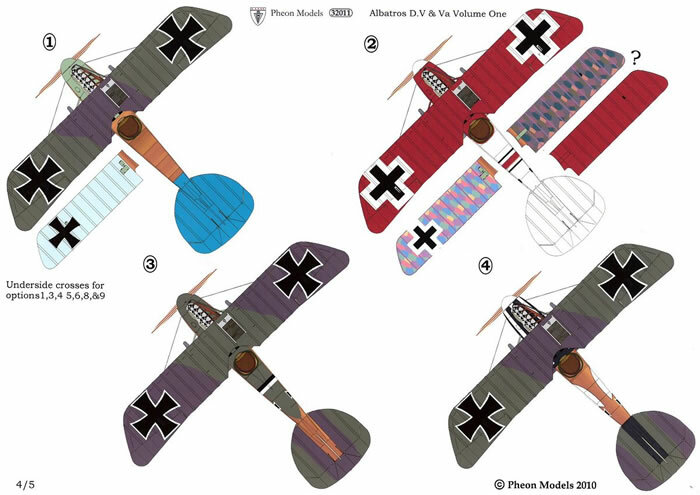 The Wingnut Wings Albatros kits come with a number of alternative parts such as airscrews and windscreens. Pheon note that it has not been possible to exactly determine the specific equipment details in all cases, leaving the choice of alternative parts to the modeller’s discretion. 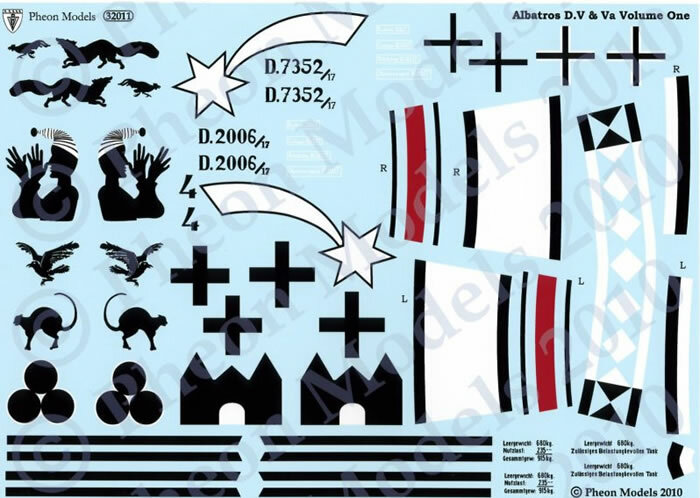 These two sets provide an attractive selection of markings for any modeller looking for something different for their Wingnut Wings kit. 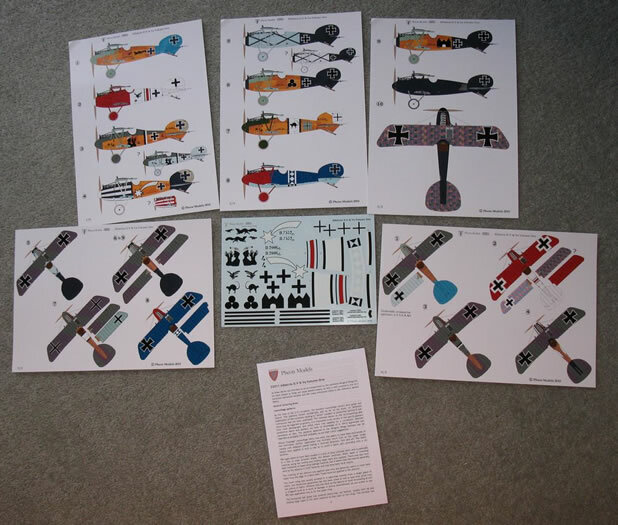 Having regard to the overall package (research, artwork, instruction booklet and decals), they are excellent value for money and I recommend them without reservation.